Take a peek behind the creative curtain of Mardi Gras. Barricades sway, reining in awestruck gazers, young and old, as larger-than-life papier-mâché creations twist and wind their way through the Port City. Waves and shouts of “Throw me something, mister,” confirm that the good times have indeed started rolling. Speckled amongst casually dressed revelers are those whose beaded gowns and white tails signal post-parade destinations — Mardi Gras balls, where lavish decorations and dramatic scenery rival any Broadway stage. But in the shadows of the fanfare are those you’ve most likely never met. Those whose callused fingers and paint-stained clothes belie their ornate handiwork; those who become so immersed in their work that night often gives way to daybreak. They are the set decorators, float builders, milliners, muralists and dress makers, all of whom work separately, yet seamlessly, to ensure Mobile’s Carnival season sparkles with just the right amount of adornment. MB is pleased to introduce five such artists. One could spend all Carnival season trying to define the man whose name has become synonymous with all things Mobile Mardi Gras. The nearly half-century he’s spent building stages and cultivating his client list certainly speaks to the veracity of his self-reported qualities. Barrett knows there’s something special about what he does. “It’s incredible that with my two hands, and my brain, I can produce this industry,” he says. 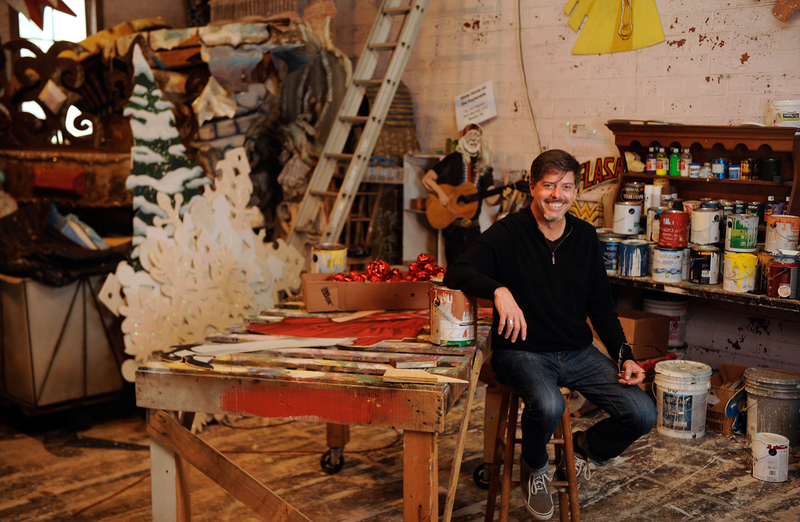 What he and his growing team of artists and craftsmen create are ornate stages for Mardi Gras balls, something Barrett has done for the past 46 years. His calling found him early. As a child, Barrett spent hours poring over tableaus pictured in newspapers. He was so enthralled by the pageantry that by second or third grade, he was cutting out cardboard shapes, emulating the images he had seen. Nowadays, Barrett’s tools and supplies are a bit more sophisticated. The cutouts he and his team construct are tucked into every nook and cranny of his Downtown warehouse. Added to the collection this year will be 37 Mardi Gras balls’ worth of decorations. With his portfolio already boasting hundreds of designs, Barrett says he is in no danger of becoming stagnant. “The creative images never stop coming,” he admits, gratefully. And from all outward appearances, Barrett himself seems to never stop. But don’t call him a workaholic. The mild- mannered artist says he could sit and stare out a window for hours, just enjoying the scenery. “One of my favorite things to do is to take a pot of coffee outside and sit until lunchtime,” he says, an audible note of relaxation teeming from his voice. But it’s not long before Barrett scurries off to check on the next project in progress. Whatever he is up to, there will be no problem describing the finished product. It is sure to be as fabulous as he. Perfectly poised amid a sumptuous sea of fabrics sits Patricia Halsell-Richardson. Sprinkled before her are copious amounts of sparkling embellishments, all of which will soon become part of her next masterpiece. Halsell-Richardson spends countless hours closely perfecting clients’ visions for their Mardi Gras dresses, trains and robes. The creative process begins long before needle hits thread. She starts by sketching, then researching era-specific designs, followed by more sketching. Even after 30 years of costume designing, the resulting fruits of her labor are still exciting. “It’s simply exhilarating,” she says, “I am just as excited as the client about the finished product. I love all of my work. My aim is to always make a showstopper.” And she’s pretty good at stopping shows, so to speak, having already had her trains and costumes on display in the Mobile Mardi Gras Museum as well as having won numerous national designer awards. 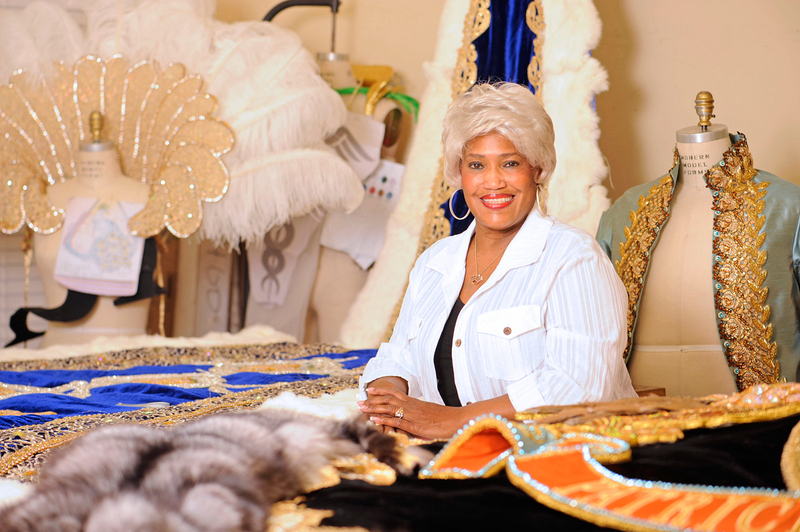 The owner of Patricia Ann’s Regal Regalia says her mother was the first person who influenced her to sew, but her raw talent was discovered during high school home economics. After graduation, she furthered her education, studying the history and construction of fabrics at Bauder Fashion College in Miami. Amid a life filled with rhinestones and bobbins, Halsell-Richardson went on to earn a nursing degree, during which time she says she learned the correlation between human physiology and the movement of clothing. Only one thing in her shop rivals the jaw-dropping assortment of garments — her personality. One could argue that it’s the sparkle found in Halsell-Richardson’s aura that gives the rhinestones their twinkling gleam. She exuberates joy and describes herself as loyal, self-motivated and a competitive go-getter. World traveler can be added to the list, too. She travels throughout the year, in and out of the country, sourcing supplies and garnering inspiration. This level of client commitment is one reason she is booked up to two years in advance — she ensures the best product. And she’s certainly worth the wait. 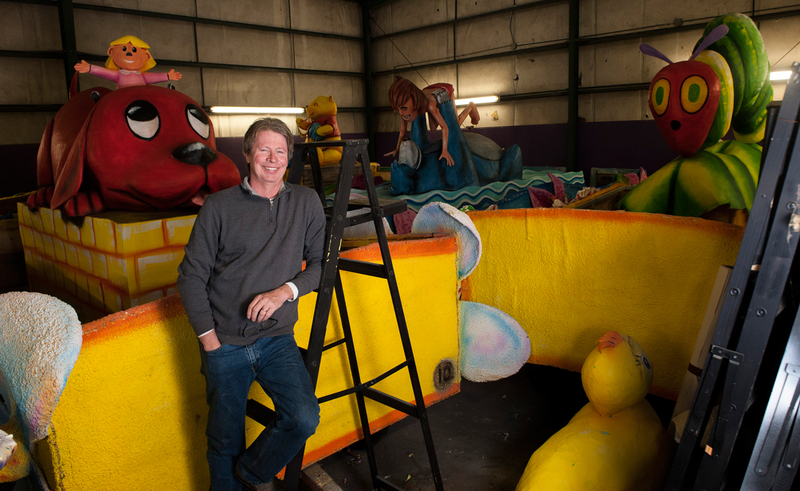 Craig Stephens glances across the chilly barn, and while he would never, ever name his favorite float — or even his favorite 20 — this year’s Floral Parade certainly includes some of his most adored children’s book characters. 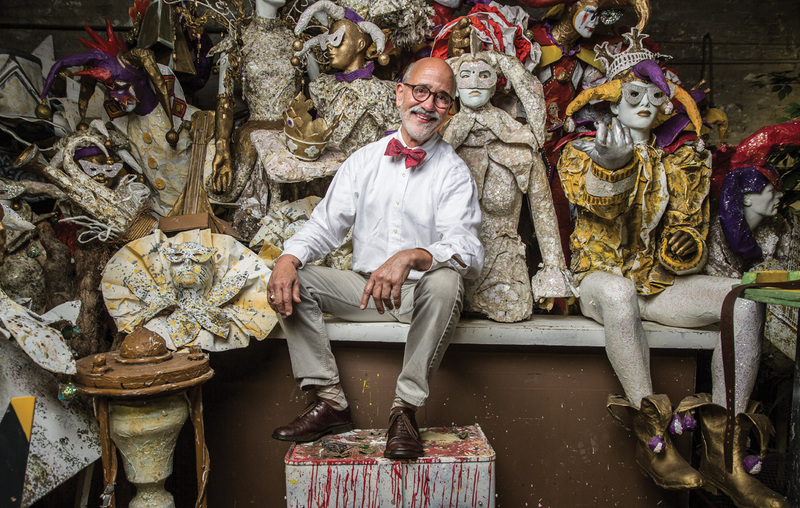 The whimsy befits Carnival Artists’ owner Stephens, a humorous man with a quick smile and an easy laugh. He says he is stressed due to never-ending deadline pressures, but you would never know it. He walks with an easygoing stride and casual pride as he points out more floats in an adjacent barn. Stephens, who has called Mobile home since 1985, earned a bachelor’s degree in fine arts from the University of South Alabama, with the expectation of becoming a printmaker. But as so often happens with the best-laid plans, things changed. “One day I walked into a float barn,” he explains, “and that’s all it took for me to know I wanted to do printmaking on a huge scale.” And he’s been working on an enormous scale ever since, having spent the last 30 years building floats for mystic societies. A recycled decoration or two might be spotted at the parade, but there is a near-guarantee Stephens won’t be. Not in the flesh, at least. His craftsmanship, however, will certainly be on full display. Case’s hats are tangible proof of her grit and passion. Although she’s sewn since age 12, she has been a professional milliner for less than a year. The inspiration behind starting her business is two-fold. First, for years while working retail, women would enter in search of hats, especially hats to wear during Mardi Gras season. “Ladies were looking for hats for all sorts of festivities, such as the Queen’s luncheon.” But it wasn’t until a trip to Porto, Portugal, this past summer that the answer to the prolonged question came to her. The colors of the town and the literal flower-lined streets planted a figurative seed in the entrepreneur’s mind, giving bloom to Rua Flores. Case also has her eye on something else across the pond. 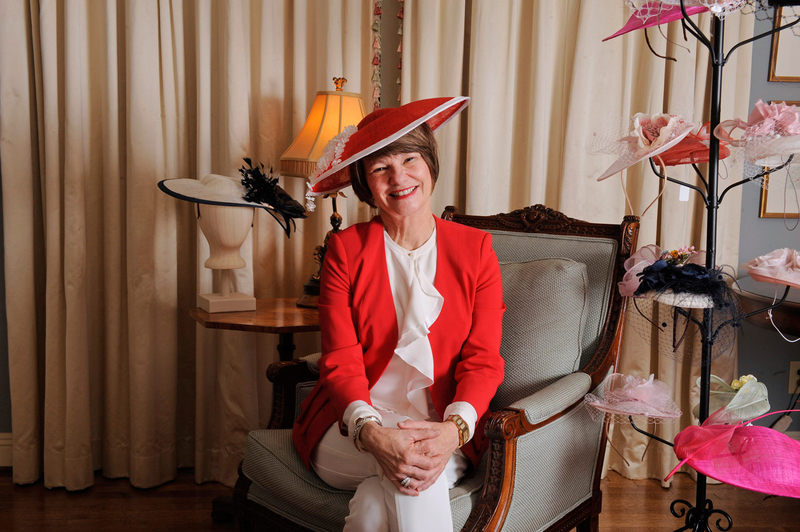 “I particularly love to see what the young British Royals wear to events like weddings and races,” she says, motioning to her hat display on which her favorite red hat is perched. She will no doubt have the regal youth in mind as she moves from Mardi Gras season toward preparation for New Orleans’ Spring Fiesta and the Kentucky Derby. In the meantime, Case is eager to showcase her immediately available Collection hats, as well as offering Bespoke hats, which are custom creations based on clients’ desired colors and styles. Contact Valerie via Facebook at Rua Flores Inspired Hats or by phone, 251-285-0294. And indeed, it is fun. One hip-shaking jive down any aisle provides childlike amazement, with every square inch of storage space bursting forth with exaggeratedly large caricatures and party decor. It’s hard not to smile. 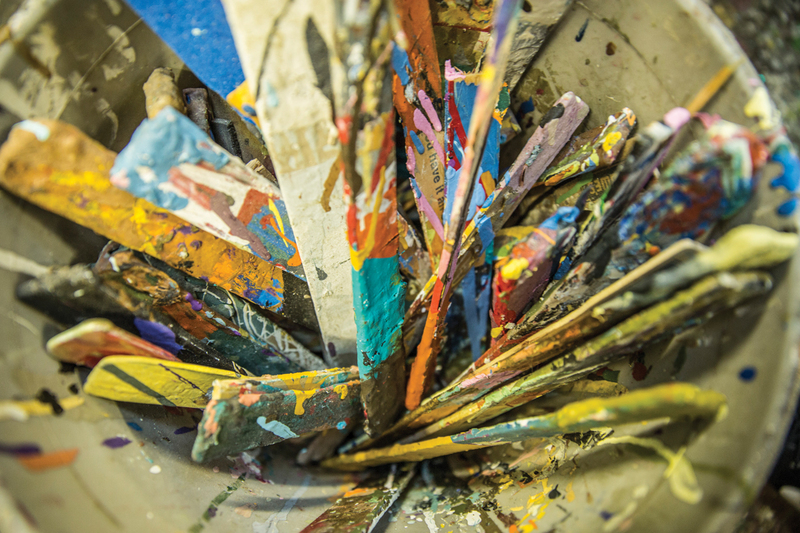 Dressed in paint-stained clothes, Fuller is right at home amongst the plywood, paint cans, grease rags and years’ worth of chronicled artwork. Hanging above the wall of his workbench are three of his favorite pieces. “I’m particularly proud of my work [that was used] at the Greater Gulf State Fair,” he says, pointing to Wonder Woman, Cat Woman and Flash, all of whom are fiercely watchful and expertly painted. Fuller trained at the Art Institute of Dallas, but he is also quick to credit his palette of knowledge to watching his artistic buddies. “I’ve been blessed with wonderful friends,” he says, grinning. Whether at the Fair Grounds, on stage or in a ballroom, Fuller’s work is sure to be a dazzling representation of his wit, talent and passion.